Caroline Alixe Rhuys is part of the artistic community in Reno, NV. Caroline uses needle felting, painting, and beading to create multi-media art for her customers to wear and display in their homes. 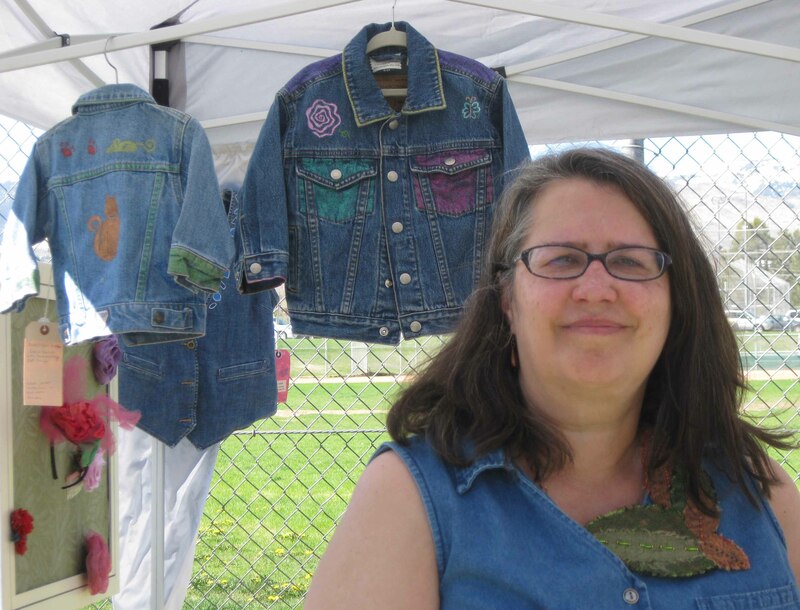 She creates her upcycled jewelry, clothing, accessories, and home décor from materials found in local thrift stores and her extensive stash of vintage fabrics, buttons, and hankies. Some favorite materials are silk, leather, buttons, beads, wool felt, wool and denim jackets, ribbons, and found objects. Caroline likes meeting other artists and supporting them by sharing their work throughout her online and personal networks. Today I washed a bunch of denim clothing and some fabric to use for my spring and summer projects. Some of the fabrics are acrylic prints that I found during various thrifting expeditions. Handling the fabric reminded me of a business I started as a teenager, while living on Maui. I sewed halter dresses with appliques of mandalas on the front and sold them in local boutiques. Other than in thrift stores, I haven’t seen any acrylic fabric lately. The colors are incredibly vivid and the fabric is easy care and long wearing. Among the items I plan to use my assortment of new and vintage fabrics for are denim vests and jackets with applique designs and gardening aprons. Some of my things will go into the Indie Reno Boutique and I will take some to the Earth Day Celebration. This year I will be one of the artisans from Indie Reno in the Artists Grove section at the Reno Earth Day celebration. For more information about the celebration, go to http://renoearthday.webs.com/. I will have many new items for sale. In addition to the jackets and aprons, I am designing some sparkly tiaras for little girls (thanks for the suggestion, Jess Miles http://www.etsy.com/people/FreeToRoam). I know that the other Indie Reno artisans with whom AlixeArts is sharing a booth will also have many fantastic things for sale. Grand Opening of Indie Reno Boutique at Wildflower Village! Recently, I joined Indie Reno, an artisan’s co-op. My original intention on joining was to meet some creative people and perhaps make some new friends. Not only have I met some very nice and artistic people, I am excited to have a “brick and mortar” location to sell my work! As of February 1, 2013, Indie Reno took over management of the gallery at Wildflower Village. We worked to repaint and redecorate the space and bring in lots of new jewelry, accessories, pottery, furniture and home décor. On March 15 and 16 Indie Reno Boutique hosted a very successful grand opening. The address of the Indie Reno Boutique is 4335 West Fourth Street, Reno, NV and we are currently open Tuesday through Saturday from 10:00 am to 6:00 pm. The attached photo shows the “rock lady” who sits in front of the Indie Reno Boutique. In upcoming blogs, I will feature not only my own work but also the beautiful and original creations of my fellow Indie Reno artists. Author AlixeArts - Jewelry & Accessories for Unconventional WomenPosted on March 24, 2013 Categories EventsTags accessories, clothing, crafts, furniture, glass, handmade, hats, jewelry, mosaics, photography, pottery, soap, steampunk, toys1 Comment on Grand Opening of Indie Reno Boutique at Wildflower Village! Had a great day yesterday at the Reno Buy Local Marketplace hosted by the National Auto Museum. The City of Reno did a great job of organizing the event. There was a steady stream of people checking out the vendors’ tables set up among all the great vintage cars. The volunteers were very helpful in guiding visitors through the galleries. The event was a great opportunity to talk with a lot of people and make some new connections. Here are some photos of my creations. Bored with your plain old shoes? Find some new shoes you love, except for the color? With a few simple supplies and some spare time, you can transform basic shoes into beautiful works of art. Lumiere paint by Jacquard works well on many materials, including leather, synthetic leather and fabric. First, I painted the heel and strap of a pair of plain fabric shoes, using two shades of green as a base. Next, I painted free-hand stripes on the strap in a darker shade of green. For the final embellishment, I painted small red flowers on the heel and a larger flower on the strap. I suggest application of a protective spray such as Scotchguard to keep smudges to a minimum. If you are nervous about painting a well-loved pair of shoes, there are many thrift stores around Reno. For less than $10.00, you could find a pair of shoes for practice. On June 23, 2012 from 11:30 a.m. to 2:30 p.m. I will be teaching shoe decoration techniques at ArtisTree Studio, located at 18 Stewart Street, Reno, NV. I will provide all supplies (other than shoes). Fabric and lace may be attached to canvas shoes with various types of glue. When I am happy with the design I apply at least three coats of gel medium to protect the shoes. You don’t have to limit your shoe colors to commercially available selections if you can use scissors and apply glue. After seeing me in clothes or accessories I have embellished, sometimes people remark “I don’t have a creative bone in my body” or “I’m just not artistic.” I believe that sometimes, lack of innate creativity is not the main issue. After all, how many of us are born with the ability to read, or calculate formulas? Learning new ways to express your creativity can be fun, relaxing, and a welcome diversion from a hi-tech world. Repurposing clothing is an eco-friendly way to show your personality through your wardrobe. Through AlixeArts I intend to help people appreciate the beauty and practicality of clothing and accessories created using a mixture of old and new materials. For residents of the Reno, Nevada area I am teaching a variety of classes through ArtisTree Studio on ways to re-create your wardrobe by painting, sewing, beading and other decorative methods. For more information on ArtisTree Studio and the classes offered there, Click http://artistreestudio.blogspot.com. Shown here is the “before” version of a pair of plain, black fabric shoes. In my next post, I will share the new, decorated, version of the shoes.